I went on a stag do to Liverpool in January and it was one of the best weekends I’ve had in ages. Nearly all of the usual stag do clichés were avoided and we actually managed to squeeze in some top notch beers in some of Liverpools best bars, in between the San Miguels and terrible dancing that is. The weekend was made exponentially better by a bit of forward planning, firstly by the best man who organised a couple of decent centrally located apartments for us to stay in, and secondly by having access to some great local knowledge from a Liverpool based friend from University – he knows his beer and recommended us some great bars. In fact, ‘recommended’, is not credit enough. He typed up and emailed me a list of all the best bars within walking distance of Seel Street near our apartments (an excellent area full of great bars all within stumbling distance of each other). Seems a shame not to share it, so here it is, only slightly edited and added to by me. I’ll start with a warning my friend gave me as the opening to the guide, because it made me laugh. 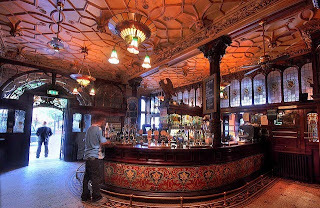 The Philharmonic - A cracking victorian pub that is quite simply stunning. It features an elaborate entrance and great selection of beers and ales on cask and keg. When I visited they had BrewDog’s Alice Porter and 5am Saint on cask as well as plenty of Cains beers. I decided it was a bit too early in the evening for a 6% Porter and opted for a 5am Saint. In great condition and excellently served, a perfect first beer. 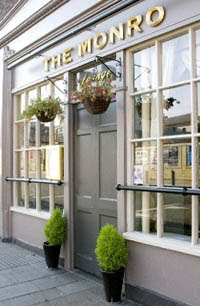 Fly in the Loaf – This is a great pub with a wide selection of world beers. Six different cask ales available at any time and always a well stocked beer fridge with excellent choices such as Brooklyn Black Chocolate stout and Orval to name but a few international favourites I’ve spotted. Pogue Mahones – You guessed it, an Irish bar. But don’t be fooled, this one’s a little diamond in the rough. Worth stopping in to have a chat with some of the drunken Irish blokes - had some interesting conversations in here myself. The Shipping Forecast – An excellent relatively new bar with a great selection of beers. Can highly recommend this one if you fancy somewhere a bit livelier. Keep an ear out for the actual "shipping forecast" playing in the gents loos. Interesting fact #2: If it looks closed from the front then you may have to go in through the side entrance (a red neon arrow showing the way). They do this because it stops the riff raff from Slater Street/Concert Square from staggering in. Santa Chupitos – Not really a place for a beer but deserves a mention as my favourite independent cocktail bar anywhere, wipes the floor with some of the tired cocktail holes in Leeds. The Cocktails are really unique and there’s an amazing atmosphere. The Cocktails are between £3-£8 but they are well worth it - truly unique and interesting with great quality ingredients such as freshly squeezed exotic fruits and high quality spirits. Follow them on Twitter. The Monro – A traditional looking, classy gastropub type place. Good selection of beers and ales and there’s usually a real log fire on the go as well when the weather turns chilly, making it a great winter warmer. The Pumphouse – One of a limited number of decent pubs near the docks. A great place in the summer because of the outdoor seating area, it’s a safe choice for a relaxing afternoon drink in the sunshine, if summer ever arrives that is. Thomas Rigby's – A great pub with a cracking selection of beers and ales including decent keg such as Brooklyn Lager and Fruli on tap, and a wide selection of regularly changing cask beers. I’ve had Okells IPA and Rudgate Ruby Mild in here and they were both in tip-top condition, reminds me a little bit of The Grove in Leeds with its traditional multi-room layout. Ship and Mitre – Offers a quite simply epic selection of 13 real ales, usually from some great microbreweries, as well as international keg beers - definitely worth a visit. Interesting fact number #3: They only ever buy one barrel of each cask brew meaning the beers are constantly changing and you're almost guaranteed something interesting to try. Be sure to check the chalk board menus rather than walking around the lengthy bar like a lost toddler. Doctor Duncan's - Great selection of beers and cask ales, and being a brewery pub the full portfolio of Cains can be found on the bar here. That said, the last time I was in here I tried the Cains Christmas beer and it tasted like someone had dropped an Ambi Pur in my pint. No reflection on the pub though, just a shockingly bad beer. So there we have it, some of what I think are the best boozers in Liverpool, any I forgot? Is there a craft beer mecca I missed? Please let me know in the comments. NB: The above is a slightly abridged version with only my favourite pubs and beer bars featured, for the full guide of 18 boozers including the ones which aren’t necessarily for beer geeks, click here. Credits: Google for the photos... I was on a stag do for God’s sake; the photos taken were few and far between and mainly involved humorous stolen hats. The Baltic Fleet? Not exactly pretty, classy or well-located, but the house beers are decent and everyone loves a brewpub, right? Fly in the Loaf would be my definite must-drink for Liverpool. The Fly in the Loaf is a top pub, easily one of the best I mentioned. I've never been in the Baltic Fleet but will definately have to give that a try. I rarely get chance to get over to Liverpool but it has an amazing amount of good bars within walking distance in the centre, which is what I've tried to cover here. Glad I could help out. Another addition I'd make to that list would be The Officer's Mess recently opened on Victoria Street. Their website doesn't list all their drinks unfortunately. However, I recently enjoyed a Brooklyn Black Chocolate Stout there. The Baltic Fleet is tucked away on the dock road so very easy to miss when doing a pub run in the town centre. Very good winter though. By the way, that's a different Neil above, not me. he's the guy who reccomended all these pubs in the first place. Excellent timing - I'm off to a stag do in May in Liverpool and have been looking for tips - most of these were on thelist but its goodto find an up-to-date review with pics! thanks! no worries mate. be sure to click on the map at the bottom and save it somewhere. That way anyone with an iphone/smart phone will know how to get to any of em! What about The Dispensary, good selection of ale (including Stringers and George Wright)and friendly atmosphere. Also the Everyman Bistro, just under the theatre. Great (reasonably priced) food, some cask and a decent list of wines by the glass. With all of you on The Fly In The Loaf, dragged Baron Orm there to make him sample European beer after the Beer Festival. The Dispensary used to be good but is impossible to drink there due to an idiotic landlord who let a few Camra awards go to his head. Smells of bleach all the time too. Every 6 months my friends and I do a real ale pub crawl visiting 18 of Liverpool's finest pubs in 12 hours. We have dubbed it 'The Real Mile' (it's more than a mile, but that sounds better than 'The Real Miles'). Here's the map from our last event if any of you fancy 'Walking the Mile'. Every Liverpool pub crawl should start at the Brewery Tap outside the Cains Brewery. I have labelled them in the order you should visit them. There is a bit of a walk between pubs 1, 2 & 3 but the Brewery Tap and The Baltic Fleet are places not to be missed. Plus it's best to get these long walks out the way first whilst you're still pretty sober! The Phil is run as a chain - and it is easy to see. The phil is a chain so their selection is available anywhere. Yes, get on a train for the phil... duh.